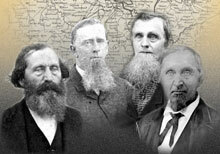 This site is devoted to the family history of the six Heinsohn brothers, Wilhelm, Friedrich, Heinrich, Gerhard, Johann, and Anton, who emigrated from Oldenburg to Texas between 1845 and 1850. We celebrate their lives every summer with the Heinsohn Family Reunion held near La Grange, Texas on the third Sunday in July. The 2018 family reunion is on July 15th at the Hostyn parish hall. This website is maintained by Rox Ann Johnson, who serves as historian of the Heinsohn Family Reunion and has been researching the Heinsohn Family in Texas for about thirty years. The site is very much a work in progress. You can expect to find many more old photographs and more biographical information soon, so please check back. Contact Rox Ann Johnson, list administrator, for more info. Visit our Facebook page: The Heinsohn Family in Texas. Search for @heinsohnfamilyreunion. This site was updated on 5/22/2018.